This article explains how to store credit or debit card numbers on Bigcommerce so you can charge customers as needed & create manual orders. If you're a BigCommerce customer you can use PayWhirl to easily store credit card data for your customers. In fact, when a customer purchases a plan through PayWhirl their payment method (credit card, debit card, etc.) will be vaulted securely within your connected payment gateway so both you and/or your customer can use the payment method again if needed. You can also use a customer's saved payment method (credit card, debit card or bank via ach) to process a "one-time" payment for an existing product in your BigCommerce store. Once complete, PayWhirl will generate an order in your BigCommerce store with all of the product information (sku, price, etc) and customer information (address, profile questions, etc) so you can fulfill the item(s) as you normally would in BigCommerce. 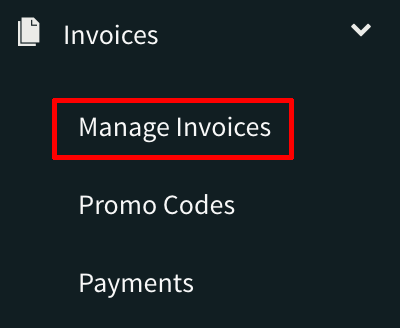 1) Navigate to Main Menu > Invoices > Manage Invoices. 2) Click the "Create Invoice" button. 3) Search for your customer by name or email address. 4) Next, search for an existing product in your Bigcommerce store. 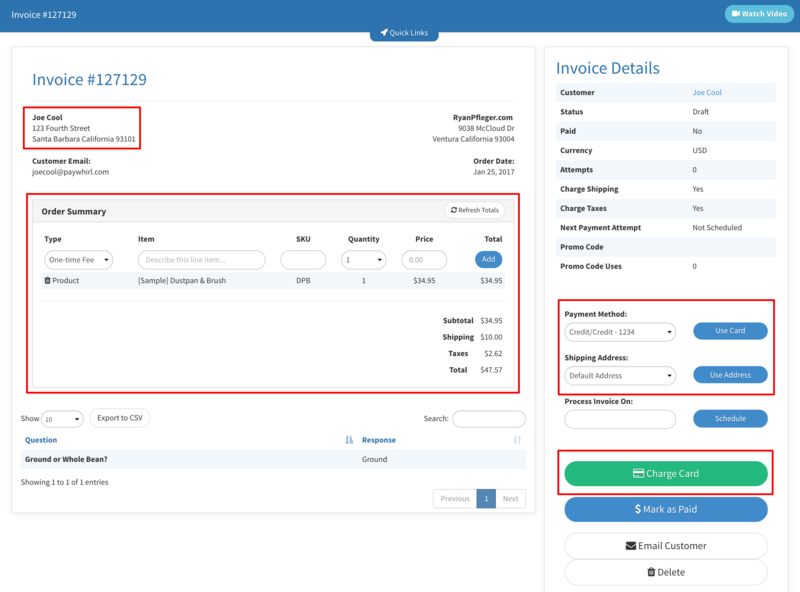 NOTE: If you do not see this section on the create invoice page, please make sure you have the PayWhirl app installed and/or have accepted the latest app permissions in Bigcommerce. 5) Once you have selected a product from your Bigcommerce store PayWhirl will fill out the line item fields automatically using the latest information from your Bigcommerce product catalog. Once you have reviewed and/or edited click "Add" to continue. 6) When you have finished adding products / line items to the invoice click "Save & Continue"
7) Finally, review the invoice to make sure everything is correct before processing the payment. You can select which saved credit or debit card to process the payment with using the "Payment Method" dropdown in the right column under "Invoice Details." Once the invoice has been successfully processed using the stored card on file you will see an order with a status of "awaiting fulfillment" in your BigCommerce account. If you have any questions about storing credit cards with PayWhirl + BigCommerce please let us know!